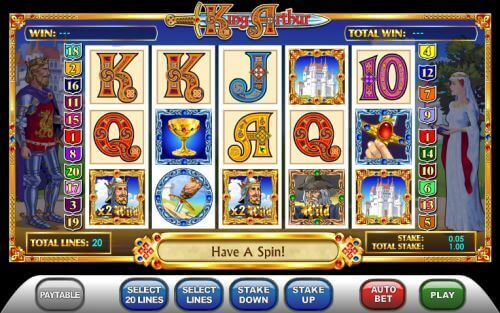 King Arthur Video Slot Review - Casino Answers! King Arthur is a 5-reel, 20-line video slot developed by WagerWorks, featuring a wild symbol, a wild multiplier symbol, scatter wins and a bonus game. You can play the King Arthur video slot at Bovada. The King Arthur casino game is a nickel slot. Bets on the King Arthur slot machine are $0.05, $0.10, $0.20, $0.50, $1, $2, $3, $4, $5, $6, $7, $8, $9, $10, $15, $20, $25, $30, $40, $50, $75, $100, $150, $200, $250, $300, $350, $400, $450, $500, $500, $750 and $1000 per line. Despite the high potential bets per line, the maximum total bet on the King Arthur online slot machine is $1000 per spin. The King Arthur video slot has a fantastic betting range that allows for a proper betting range for all slots players. 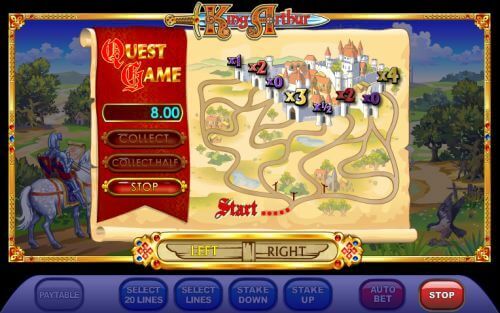 To play the King Arthur slot game, select your bet and press the “Play” button. The top-paying symbol is the King Arthur symbol. By hitting 5 King Arthur symbols on a selected payline, you can win the 10,000 coin top jackpot. The King Arthur symbol is a wild multiplier, which means that whenever the symbol appears in a winning combination, the win will be doubled. However, that’s not all by a long shot! There is also a Merlin wild symbol. It too has a high payout of up to 5000 coins. Both wild symbols will substitute for all symbols on the King Arthur casino slot, except for other wilds, scatter symbols and the Camelot bonus symbol. Use the King Arthur wild multiplier to win big on the King Arthur video slot by playing it at Bovada! The Sword in the Stone is King Arthur’s scatter symbol. You can get a scatter win by hitting three or more Scattered Sword in the Stone symbols. However, the scatter win feature has a twist on the King Arthur slot machine. Instead of simply getting a scatter win, you can pull up to 5 Swords from the Stone to multiply your scatter win by up to 32X! In total, this gives you the ability to win up to 800X your total bet! Payouts are made according to the Paytable. All wins pay left to right, except for scatter wins (which pay any). All wins are multiplied by the bet per line, except for scatter wins. Scatter wins are multiplied by the total bet. Only the highest current win is paid per selected payline. The Rich and Famous online slot has a basic autoplay mode. Press the “Auto Bet” button to select 10, 15, 20 or 25 autoplay spins. Start the autoplay mode by selecting your bet and pressing the “Play” button. Stop the autoplay feature at any time by hitting the “Stop Autoplay” button. The King Arthur video slot is fairly solid, although it lacks a free spins feature. Its bonus game is interesting, but is hardly top-of-the-line. It also has a couple of wild symbols, including the wild multiplier. You can play the King Arthur online slot at WagerWorks online casinos such as Bovada. Can American players play the King Arthur video slot for real money? No, American players cannot play the King Arthur slot game for real money. Instead, we suggest that you play at a USA-friendly casino like Bovada.